My husband tells me I look beautiful and that he's in awe of what my body is doing. 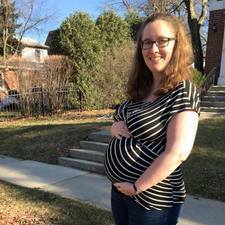 While I, too, am in awe of my what my body is doing, of the miracle inside me, as my pregnancy progresses, I've also felt more and more uncomfortable and awkward. Early in my pregnancy, I remember standing before a mirror, relishing each new curve of my body. Now, I try to avoid mirrors whenever possible, not wanting to see yet another stretch mark that's appeared overnight. I am, after all, growing a baby. But the struggle is real. In a culture that values appearances, loving our bodies – even a pregnant one – can be hard. On Maundy Thursday, the day in which we remember Jesus washing the feet of his disciples, my husband and I worshiped with our congregation. In the years we've been part of this congregation, we've fallen increasingly in love with it's liturgy and the ways in which our sanctuary is decorated. Our sanctuary is decorated simply – with colors that correspond to the season of the church year. For example, throughout lent, purple fabrics adorn the pulpit and altar, which also always contains candles and communionware. A paschal candle sits next to the baptismal font and other candles hang from the back wall. As the congregation sings, two women remove each of the things adorning the altar and the front of the church, one by one. They extinguish the candles and remove them from the altar. They take the communionware from the altar, as well as all the fabric decorating it. The stripping of the altar reminds us that at the crucifixion, Jesus was also stripped. John's account of the crucifixion tells us that the soldiers divided his clothing among them. He was laid bare for all to see – for the soldiers and the bystanders as well as those who knew him, like his apostle John and his mother, Mary. The stripping of the altar is for me, a reminder of the physicality of Holy Week. Jesus, who was born physically, also died physically. What's more, his resurrection was a physical – not just a spiritual - one. His resurrected body bore the scars of the crucifixion. So often, especially in more evangelical contexts, we celebrate Easter without first thinking about the reality of Jesus' death. But to me, Maundy Thursday is a reminder that we can't get to the resurrection without first enduring death. Maundy Thursday worship ends as soon as the altar has been stripped, when the congregation is invited to simply leave in silence. It's always hard for me to do so. It's hard to leave without a happy ending, when things feel so unfinished. It's hard to leave with your emotions raw, having been stripped bare by a physical reminder of your Savior's death. And yet, we do. We leave and re-enter our lives - A life in which I am currently pregnant, oftentimes feeling stripped bare myself, uncomfortable in this new body of mine, worried about my daughter's rapidly approaching delivery, and yet thankful for this miraculous time and for the baby growing inside me. We leave, dwelling in the reality of Jesus' death, waiting for Easter to come. And with it a reminder that through Jesus, death has lost it's sting. Through Jesus' death, all things have and are being redeemed. I have, for years, known and believed this. Yet, the sad reality is that sometimes this truth fails to penetrate every aspect of my life – especially when it comes to my body. But this year, as I think about the stripping of the altar and of Jesus, what I'm learning is this: Because Jesus died a physical death and rose from the dead in a physical body, his resurrection redeems our bodies as well. Our bodies – which may not be the right shape or size – are beautiful. They are created by a loving God. And so this morning, when I looked at my body in the mirror, I once again stood in awe of it and my Creator. Rather than resent my stretch marks, I saw them for what they are: Reminders of the new life growing inside of me, of this body of mine doing exactly what it was created to do. 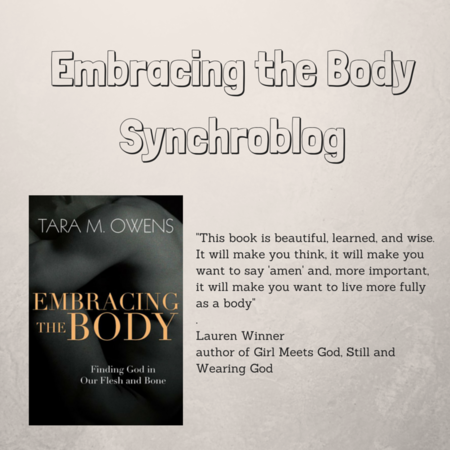 Today, I'm linking up with Tara Owens to celebrate Holy Week and the release of her new book, Embracing the Body.